The downloaded application is Free Edition which can be upgraded to Standard Edition or Professional Edition. You can test the free version before deciding whether to buy higher editions. 1. Optimize the function to restore NTFS partition from image and improve restoring speed. 2. Optimize the speed of cloning NTFS partition. 3. Optimize file recovery function for NTFS partition. 4. 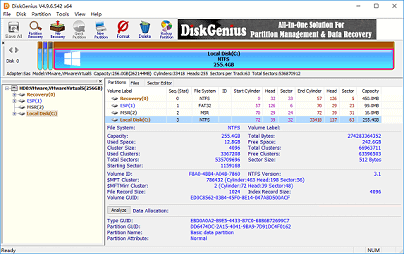 Optimize file recovery function for FAT32 partition. 5. During creating new partition, it allows to preset formatting parameters like Cluster Size and Volume Label. 6. Create New Partition and Quick Partition dialog boxes automatically judge sector number required for partition alignment, and do not show sector number that does not meet alignment requirement. 7. Improve stability of cloning partition or disk by hot migration. 8. As to OEM partition on GPT disk, partition name on Disk Partition Structure area shows "OEM". 9. When a disk is cloned by file, the application automatically changes to by sector when encountering encrypted partition which is not decrypted. 10. Default settings of Quick Partition function save configurations like partition size, file system format, volume label, etc. 11. Add a function to optimize disk by way of TRIM technology. 12. The status bar shows recovery success rate reference value for current partition after File Recovery finishes scanning. 13. Optimize video file preview feature and prevent exceptions. 1. Fixed an issue that in rare cases it appeared on operations of writing files to NTFS partition. 2. Fixed an issue that in rare cases application froze when deleting folder from NTFS partition. 3. Fixed an issue that in rare cases application crashed during backing up NTFS partition by file. 4. Fixed an issue that application launched with low speed in WinPE. 5. Fixed an issue that volume name was not correctly set for FAT32 partition. 6. Fixed an issue that exception occurred when loading VHD with fixed format. 7. Fixed an issue that it couldn't align partition to sector number which was less than 2048. 8. Fixed an issue that in some cases exception occurred during searching for hex or string in sectors. 9. Fixed an issue that sometimes it couldn't find out partitions when searching from customized cylinder range. 10. Fixed an issue that the incremental backup of EXT4 partition generated an excessively large image file. 11. Fixed an issue that partition number was not restored after loading default settings of quick partition. 12. Fixed an issue that files could not be filtered by size after searching for lost data.